The traditional image of an orange goldfish swishing its fins in a crystal-clear goldfish bowl is far from an ideal setup. 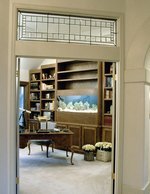 Waste accumulates quickly in such closed quarters, exposing your fish to disease or worse. 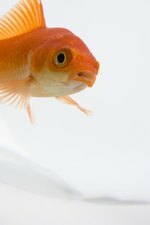 If you're setting up a temporary home for a goldfish in a bowl, put cleanliness first and get ready for frequent water changes. You can house baby goldfish in a bowl, but be prepared to upgrade to an adequate tank. Only use a bowl for goldfish as a temporary home, such as when you're cleaning his tank or transporting the fish. You also can house very young fish an inch long or so temporarily in a bowl, but be prepared to move the fish to a larger tank as they grow rapidly. A common or comet goldfish requires about 55 gallons as it can grow up to 12 inches long, and a fantail goldfish needs at least 20 gallons. Not only are these active fish who need room to thrive and quickly outgrow most enclosures labeled as goldfish-friendly, but they're dirty fish. Waste produces high ammonia, and any healthy goldfish enclosure needs to be ammonia-neutral. Ammonia in turn produces nitrite, which can choke your goldfish of the oxygen he needs to live. Rinse a new bowl without soap under warm water, drying only the outside to avoid leaving any towel fibers in the fish's home. You can skip the water treatment step by filling the bowl with room-temperature bottled drinking water. If you're filling up the bowl with tap water, remove the chlorine first with an aquarium treatment. Know how many gallons your bowl accommodates to accurately measure the amount of dechrlorinator, and let the water acclimate to room temperature for a few hours before adding fish. If adding a fish from a store, float the bag in the water for 20 minutes to let the fish adjust to the temperature. Keep a spare bowl to prep clean water for changes; after treatment and acclimation to room temperature, transfer the fish if you're cleaning the whole bowl or swap the appropriate amount if doing a partial water change. Use a ramekin or small glass for easy water scooping with partial changes, and a net to catch the fish. Since goldfish are cold-water fish, no heater is needed. Put the bowl in a place where the room temperature remains fairly constant, not in a window that gets sunshine or near a drafty doorway or window. 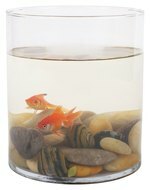 Some goldfish keepers prefer not to line the bottom with gravel as it makes cleanup of waste easier. Small substrate also can get sucked in your fish's mouth as he picks at the bottom for fallen food. If you do add gravel to the bowl, make sure it's larger than your goldfish's mouth and doesn't have sharp edges. Rinse new gravel before adding it to a bowl and rinse solid waste out of the gravel whenever you do a complete water change; a kitchen sieve can keep gravel pieces from dropping down the drain. Goldfish don't need plants or hollows to hide in, though they do enjoy live plants. If you decide to add decorations, keep the clutter level low, plants in the background and the swimming space as open as possible. Another concern about putting a goldfish in a small space is making sure the fish is getting the oxygen he needs. Some people add bubblers or air stones to agitate the water, but a filter should adequately stir the water in a bowl while helping clear out waste and pollutants. Small power filters are designed to hang on the edge of the bowl rim; keep this in mind when picking a bowl. Buy water testing strips to check weekly that filtration is helping to keep levels appropriate in the bowl, and increase the frequency of water changes if nitrites are too high or ammonia is anything more than zero. Do not overfeed as this leads to more waste. Count on 50 percent water changes two to four times a week even if using a filtration system due to the small space and type of fish.